The DigiTech FreqOut Natural Feedback Creator allows you to get sweet, natural feedback at any volume, with or without distortion. The FreqOut automatically identifies the harmonic content of your chords or single notes and then “encourages” user-selectable harmonics to feedback. It sounds full and natural, just like a live amp at ear-splitting volume, but without the permanent hearing loss. 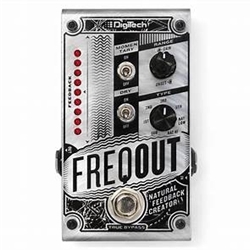 The DigiTech FreqOut uses advanced pitch detection technology to identify the harmonic content of your signal and help certain frequencies to feedback. Control over the feedback harmonic, the onset speed, and level, allows you to tailor the feedback to sound completely natural and musically appropriate. The footswitch can be set to activate feedback creation either momentarily, for quick temporary feedback, or latching to turn it on and let it roar. A dry-kill switch allows you to eliminate your dry guitar or bass signal to achieve trippy, synth-like tones.